The Chapel Choir of the Royal Hospital Chelsea made a welcome appearance on the concert platform on Wednesday 12 April 2017, when conducted by William Vann (musical director of the Royal Hospital Chelsea) the choir performed Handel's Messiah at Cadogan Hall with the London Mozart Players. The soloists for the oratorio were drawn from members of the choir with the 18 members of the choir sharing the solos. The performance was dedicated to the memory of David Angel, co-principal second violin with the London Mozart Players since 1995 who died suddenly recently whilst teaching. 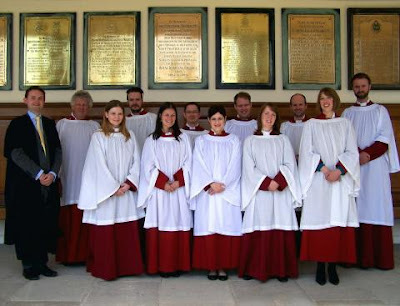 The chapel choir has a core of 12 professional singers who sing at services in the chapel of the Royal Hospital as well as on other special occasions, when the group is augmented, and the singers come from a variety of musical backgrounds mixing specialist choral singers with those with an operatic background. London Mozart Players contributed a crisply stylish account of the overture, and throughout the performance they provided lively and vibrant playing which, whilst not historically informed, gave us plenty of crisp attack, bounce and air between the notes. The balance, with 18 singers and 18 orchestra (plus harpsichord and chamber organ) was pretty near ideal, with each group creating a strong impression and neither in danger of obliterating the other. The chorus made a good strong sound, creating a sense of real engagement and throughout the performance their words made a very strong effect. We certainly did not need printed words to follow the libretto, and most importantly the choir gave the impression that the words meant something. Words are as important as the music in Handelian oratorio and Charles Jennens, who assembled the texts, had particular didactic intentions for the piece with its combination of religious narrative with musc. So it was good to hear a group making reflecting these priorities. Messiah might be familiar but that does not make it any easier to perform. Whilst some of William Vann's tempos had quite a romantic feeling of rubato and relaxation to them, his speeds could be swift as well and the choir followed him admirably, giving us some vividly projected and nicely accurate runs. During the great sequences of choruses in Part Two, Vann encouraged his singers to project a strong, vibrant sound, giving us some thrilling moments, yet accuracy and clarity rarely suffered so that we still had a nicely focused sense of the music's detail. And the performance never overbalanced into something too operatic. Overall it was the vivid sense of engagement and vitality which I took away from the performance. something which was shared by the orchestral players, this was very much a team effort. We all remember the trumpet solo from 'The Trumpet shall sound' (which was excellent) but there were plenty of other, less showy, instrumental felicities in the performance. As ever with modern instrument performances, I felt that the harpsichord was underpowered in the tutti passages and that James Orford could have done with playing on a more Wanda Landowska-style instrument. Similarly the chamber organ (played by George Inscoe), though a practical solution, did sound a bit feeble at times in the choruses. The solos were divided up between the 18 singers, so that we got the chance to hear each one in a solo moment. Some singers were familiar to me, and I have heard them in other solo roles elsewhere, whilst others were new faces. All the performances were more than creditable, and we heard plenty of strongly characterised Handelian singing, with plenty of technical skill including some striking runs. The style of solo varied, some singers have extensive operatic experience whilst others are specialist choral singers, but each brought a very particular quality to their solo. Whilst it is invidious to select particular individuals, there were some which were notable. Eloise Irving projected a real sense of joy in 'Rejoice Greatly', Clara Kanter sang 'He was despised' with beautifully even, straight tone and meaningful directness, Thomas Stoddart sang 'The Trumpet shall sound' with great aplomb, whilst tenor Edward Hughes opened things with a vibrant account of 'Comfort ye' / 'Every valley' as if he really meant it. All the singers valued the words, and I have rarely been at a performance of a Handel oratorio where this sense of the importance of the meaning of the text was so paramount in both the solos and the choir. The event had very much a family atmosphere, the row in front of us was taken by Chelsea Pensioners, and many other people in the audience knew the singers and the choir. The oratorio was understandably cut slightly, but this did not lessen our enjoyment and I hope to hear the choir again soon out of their choir pews.